Click here for part 1 of "Wolf Mythology". - Sorry, page is still "work in progress". It is amazing to see that wolves play an important role in creation myths across the world. For example, wolves are considered the ancestors of humans, not only for the Ainu in Japan or in many North American creation myths, but also for Mongolians, Turcs, Chechens, Inuit, Senegals and ancient cultures, like the Hirpi, Dacians, and somehow also for the Romans (see page 1). For the Ainu (who live on the island of Hokkaido, North Japan), the wolf was an important god, Horkew Kamuy, the "Howling God" (also Horkew Retara Kamuy "White Wolf God" or Horkew Kamuy-dono "Lord Wolf God"; N.B. : kamuy is more or less equal to the Japanese word kami, 'god', 'divine spirit', etc.). There are myths of a white wolf that mated with a goddess, and the offspring from this union became the ancestors of the Ainu people (also see below for comparable North American native and Mongolian creation myths). According to Walker (2008): "Interestingly, in Ainu lore, wolves usually were friendly toward people, as in one story from Tokachi in which a wolf saved an elderly Ainu woman from an evil bear god while she picked wild plants". "In an earlier Ainu world, a world yet to be disrupted by the Japanese intrusion from the south, the landscape was alive with wolves, busily hunting deer, raising their young, and, at magical times, aiding people and descending from the heavens to inhabit sacred moutains and forests, much as wolves did in the tradition of some Japanese villages." (Walker 2008). Ainu villages are also said to have raised wolf cubs and then used them as hunting companions. The spread of western influence and Japan's "modernisation" in the 19th century sparked off strychnine poisoning campaigns and the indigenous wolves of Hokkaido, like in the rest of Japan, became quickly extinct (1889). See B.L. Walker, The Lost Wolves of Japan, 2008. 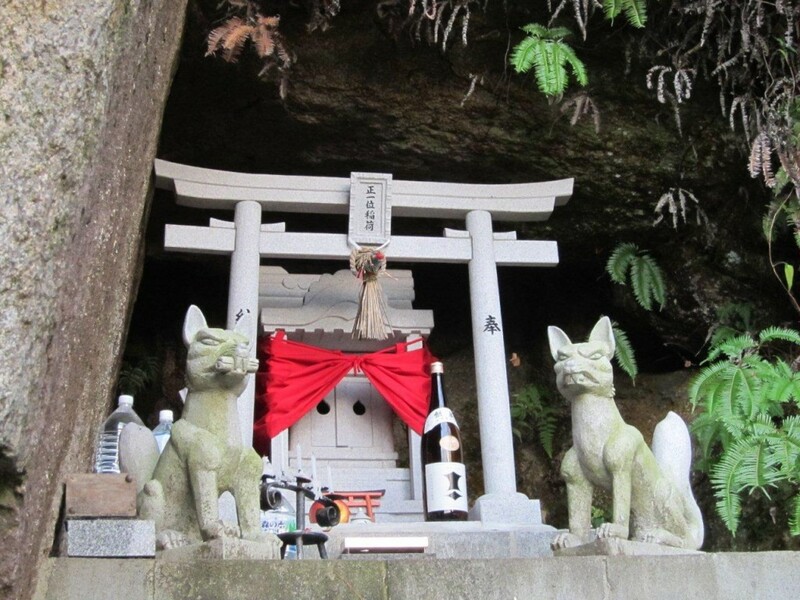 At IIitate we find a famous "wolf shrine", the Yamatsumi Shrine. The name Toratori-yama, „Tigerfang-Berg“, derives from the bandit Tachibana no Sumitora (橘墨虎, Sumitora, literally „Tuschetiger“ heißt) who was captured by Minamoto no Yoriyoshi (AD988–1075), assisted by a white wolf in whose honour the Yamatsumi-jinja (山津見神社) was founded in AD1051 (yamatsumi, the "mountain god"). 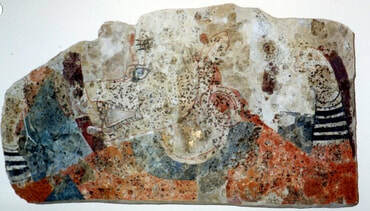 In the haiden ("hall of worship"; Gebetshalle) there are numerous white wolf statues and 231 ceiling frescoes depicting wolves.(haiden). Every year, on the 17th day of the 10th lunar month, there is a religious festival in honour of this lupine "mountain god". See images below. 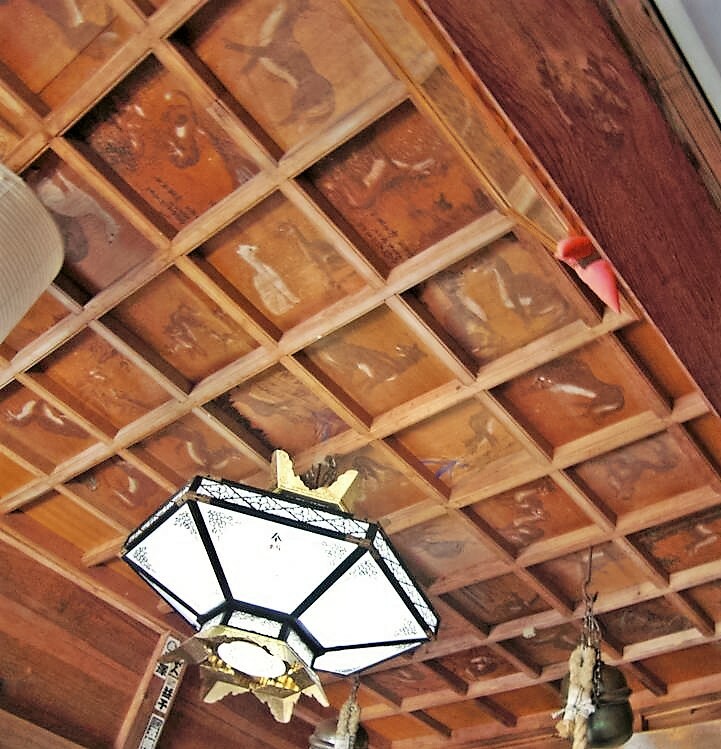 Three wolves on the ceiling of the hall of worship ("haiden") at Iitate (Fukushima Prefecture) which unfortunately burnt down in April 2013. 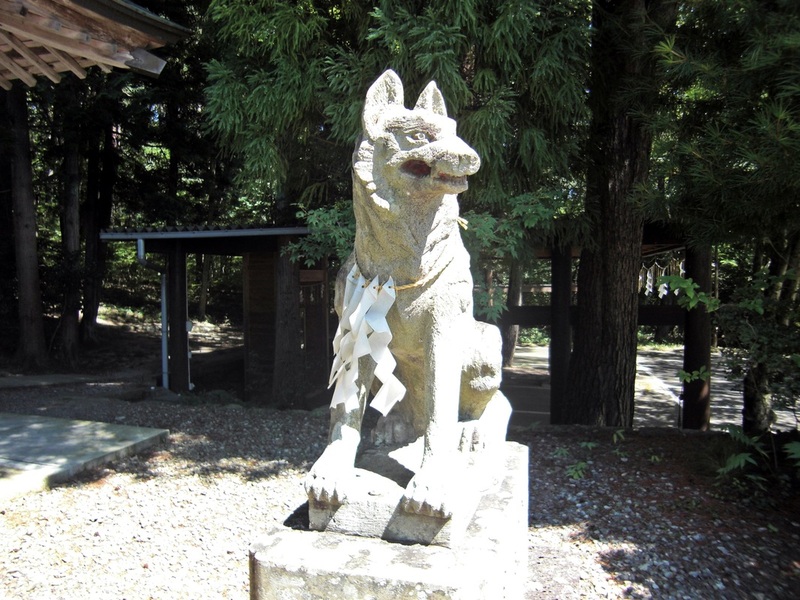 The Wolf God from Yamatsumi Jinja. 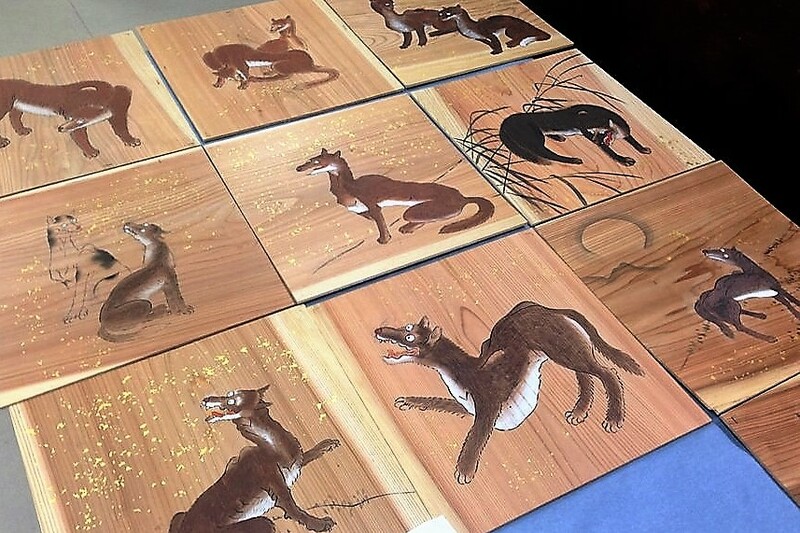 Restoration of the art work that was lost in the 2013 fire. 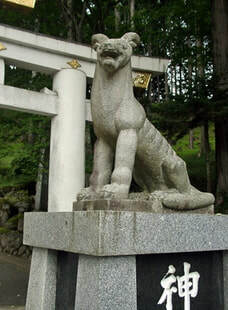 White wolf kami, Yamatsumi Jinja shrine, Iitate, Soma District, Fukushima Prefecture, Japan (photo: Bachstelze [Wikimedia]). These statues are often painted white: this symbolises their role, e.g. as messengers of the kami. Borte-chino, the blue(grey) wolf, was the wolf ancestor of the Mongols (according to e.g., the Bolar Erikh and the Nuuts Tovchoo). The Wolf and the Eternal Heaven constitue the beginning of a line that culminated in Chinggis Qan (Genghis Khan). With the adoption of Buddhism, Borte Chino was re-interpreted and became a descendant of rulers from India and Tibet (cf. D. Eisma, Chinggis Qan and the conquest of Eurasia, p.,138). There are lots of similarities between Mongolian and Turkish: there, we also find the story of Ashina/Asena, "noble wolf" in Turkic languages, a she-wolf, from whom Turkish tribes descent according to myth: Asena founded the Ashina Clan who ruled over the Turkish empire (cf. al-Mas’udi text). (The Old Turkish word for 'wolf' is Böri, similar to the Mongolian Borte). Northern Mongolia: "Totem" with grey wolf and white doe (Hun tomb, 3rd-1st century BC). Born according to the will of the Sky, Borte Chino (Blue Wolf) is the ancestor of the Mongolians; his partner/wife is Gua Maral (Red Deer). In Inuit mythology, we find the Amarok/Amaroq, a gigantic gray wolf (for the Inuit, the word amarok is only used for the legendary, mythical wolf). There are numerous stories about Amarok, like the one of the boy whom the Amarok instructs to return daily to him in order develop the boy's strength, or the story of the mourner who kills the Amarok's cubs; subsequently the Amarok, "from which nothing remains concealed", took the mourner's soul from his body (cf. H. Rink (1997), Tales and Traditions of the Eskimo). Moreover, the Amarok plays an important role in Inuit cosmology. Mowat (1974) records this indigenous story: According to the myth, humans only hunted the best and strongest caribou (reindeer) so that finally only the weak and ill were left. The sky god, Kaila, had to intervene and went to Amarok, the Spirit of the Wolf. Kaila demands that Amarok's children, the wolves, only eat the weak and ill caribou, so that their herd becomes once again numerous with large and fat animals so that the humans ("the Sons of the Woman"), can once more hunt again. As a result, in Inuit cosmology, Humans, Caribou and Wolf are One: "Et pour les Fils, le Loup et le Caribou ne sont devenus plus qu'un. Car, si le caribou nourrit le loup, le loup conserve le caribou en bonne santé" (Fairley Mowat, Never Cry Wolf 1963; Larousse, s.v. wolf). We already talked of the 'heavenly dog' in China, Tiangou, 天狗 , comparable with Skalli and Hati in Norse mythology, chasing the sun (see page 1). 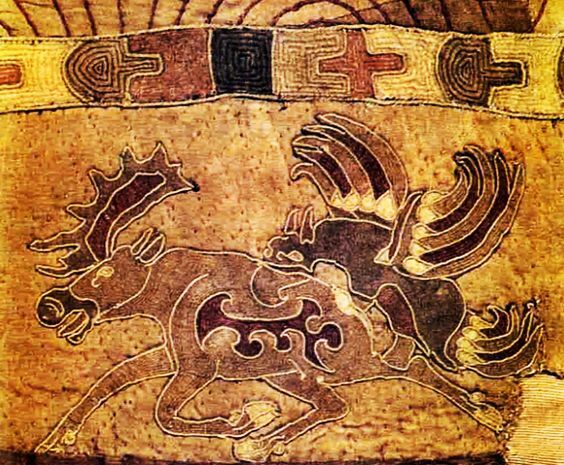 There is also this enigmatic wall painting that was found in the Kingdom of Khotan (modern Xinjiang Uyghur Autonomous Region, China) which seems to depict what appears to be an anthropomorphic representation of a wolf deity (this is hardly a 'rat' as some have suggested!). If we follow Kothan legends and myths, then the wolf deity might represent "a spirit protecting the health of children" (Whitfield (ed. ), "Khotan: a kingdom of remarkable diversity", in: The Sill Road: Trade, Travel, War and Faith, British Library, Chicago 2004: 137). The wolf also plays a role in local dynasties; for example, the first kings of neighbouring Yarkand had the family name Gurga (perhaps from the Persian/Kurdish word gurga, “wolf”) (cf. L. Christopoulous, "Hellenes and Romans in Ancient China", Sino-Platonic Papers 230: 23). Ornament in form a coiled wolf from NW China, c.5th-4th century BC. 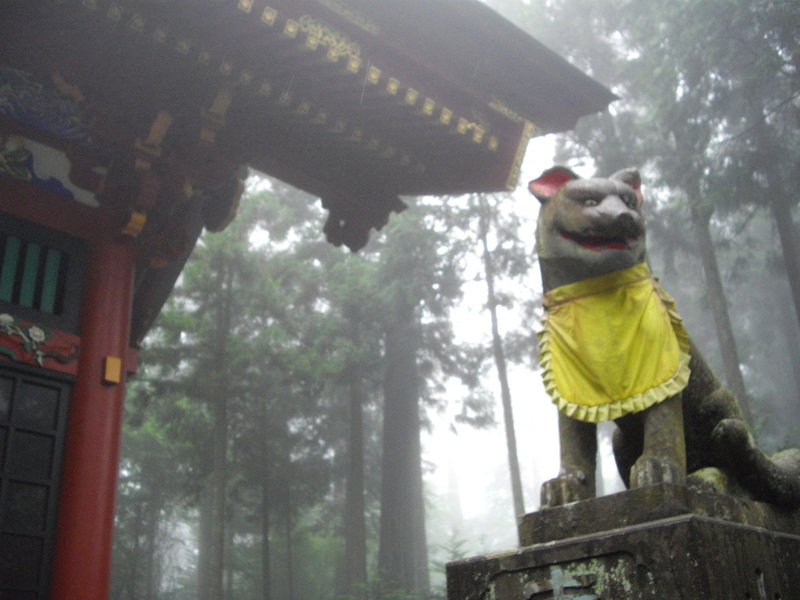 Temple dedicated to 大口真神, the Japanese wolf-god, literally the 'Large-Mouthed Pure God'. Also see left column for the (divine) role of wolves in creation myths, sometimes even as god of creation and/or ancestor of humans! On ﻿﻿page 1﻿﻿, we also saw the Greek gods Apollo, Artemis and Zeus as 'wolf-gods', and in Norse/Germanic mythology wolves are equally divine beings, like the wolf Fenrir, son of the god Loki. 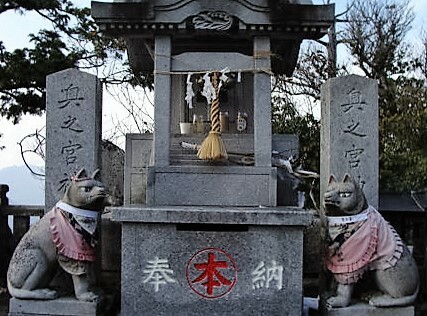 Inari Ōkami (稲荷大神), major kami ('god') in Shinto with some 30,000 shrines dedicated to him/her. 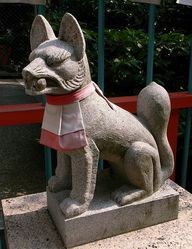 Here, a popular kitsune (fox) statue from Inari shrine (rather a wolf, apart from the bushy tail). See images below. 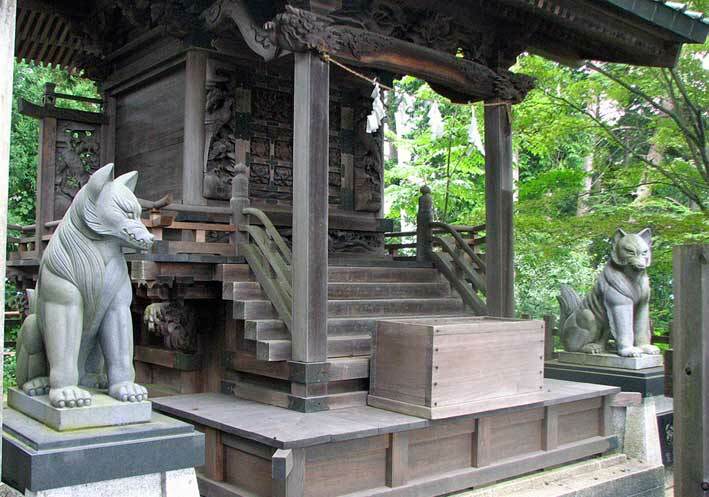 Let us start with Japanese religion where the wolf had (and still has) various divine roles. 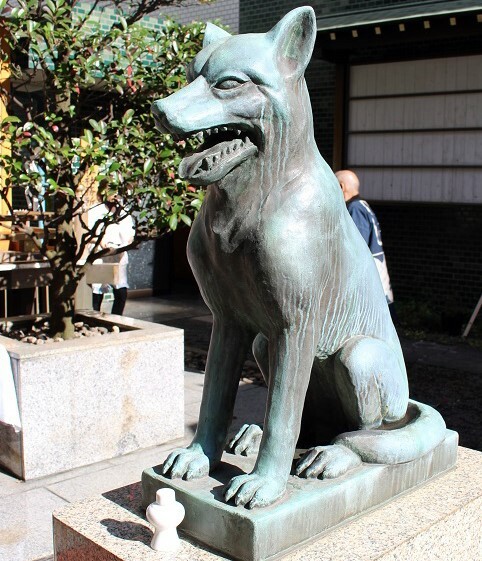 Today, he can still frequently be encountered at Shinto sanctuaries, where the wolf, ōkami/狼, could be the divine messenger of the mountain deities (山の神, yama no kami). But sometimes he is more than just a messenger, he is actually a god. In this respect, we could also refer to Inari Okami, 稲荷大神, a poweful god, often considered the "kami of foxes". 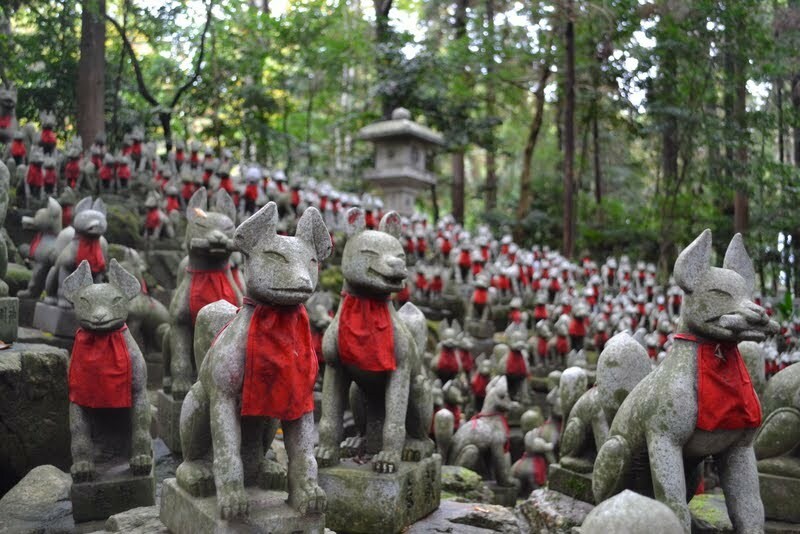 He was the god of fertility, rice, agriculture, general prosperity and success; some worshippers consider Inari to be a 'fox deity', hence the countless fox statues at the entrance of Inari shrines (see images at bottom of page). The wolf as god is above all worshipped under the name of Ooguchi no Magami, 大口真神, the "Large-Mouthed Pure God" (magami まかみ/真神 [Kanji: 'true-god'] is also an archaic version of ōkami, 'wolf'); 大口, ōguchi means 'big mouth'). Once he was a very popular god and still today he is worshipped at some shrines, like Mitsumine, Ryogami Shrine and Mitake. 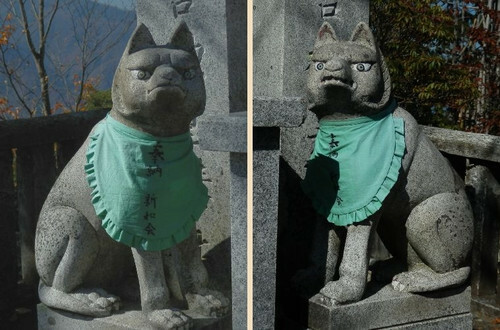 There, the komainu - the shrine guardians - have the form of a wolf (see images below). An important Wolf Deity Festival is the Ooguchi magami matsuri, 大口真神祭り. It takes place at the Musashi Mitake jinja (jinja=shrine) (武蔵御嶽神社) in January (amazingly, in other cultures January is also associated with wolves, e.g. it was the Saxon Wulf-monath, "wolf-month", and for North American Indians it was the 'wolf moon'). Ancient historic accounts from Japan report this mythical story how the wolf deity, a white wolf (白狼, shirōkami), in times of need suddenly appeared to Yamato Takeru, son of Emperor Keikko (around AD100). Takaru got lost on a road near Mitakesan (御嶽山) when a local demon shapeshifted into a white deer (白鹿) and obstructed the road. The white wolf showed him the way and let his army on the right path, "and Takeru commanded the white wolf to stay in Mitakesan as a true god, in order to slay any local demons." 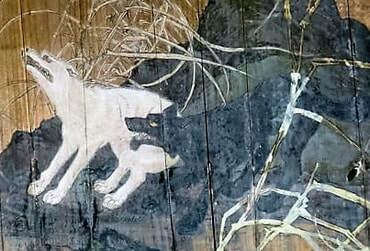 The wolf god, 大口真神, as Shirookami (white wolf: 白狼), protecter and helper in need, depicted on a 3x2m large wooden panel in the temple of the Musashi-Mitake Jinja on the 923m high summit of Mt. Mitake (nr. Tokyo). (Hiresaki Eiho's work entitled 武尊深山跋渉之図, "Takeru Miyama Bassho Noriyuki Figure" from 1909, siehe unten für Photo der gesamten Darstellung). To appease 大口真神, the 'Large-Mouthed Pure' Wolf God, he received deer and wild boars as offerings. People used to live in co-existence with wolves for centuries; not only did wolves rarely show themselves (after all, they are very shy animals who avoid humans), but they also helped people to chase away or kill the "vermin that was roughening the fields", i.e. boars, deer, etc. (sorry for the term 'vermin', quote from http://www.musashimitakejinja.jp/ - 10/04/2016). 大口真神 therefore became a protector deity for good people, i.e. those who fed him, while he punished the bad ones. Indeed, wolves in Japanese mythology are often judges of humans, being able to tell who is a good person and who is a bad one. We also see this in other cultures where wolves are equally judge of character, see e.g. Amaroq in Inuit culture. 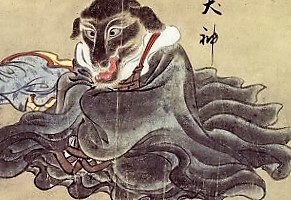 The wolf was/is a popular deity as he/she prevented robbery and fire, and is therefore frequently depicted on votive tablets (so-called ema, 絵馬) (see images below). o-inu-sama, "Great Honourable Dog". 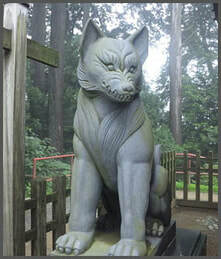 Wolf statue from the shrine Mitsumine Jinja, N. of Tokyo. 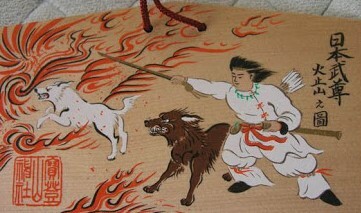 Ofuda, protective talisman, from Mitsumine Jinja (Shinto Museum, Kokugakuin University). Amulet/talisman of the wolf deity. The wolf is said to protect against fire, theft, illness and many more... A god for health and longevity, protecting during journeys and travels. "When Tokugawa Ieyasu took refuge in a mountain to escape from the attack of the Takeda clan, the mountain suddenly began to quake and he heard great roaring of a wolf, which drove away the enemy." 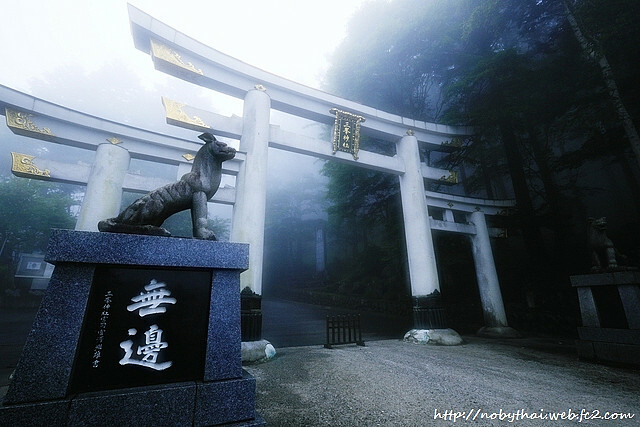 Yamatsumi Shrine (山津見神社), protected by the white wolf (白狼). 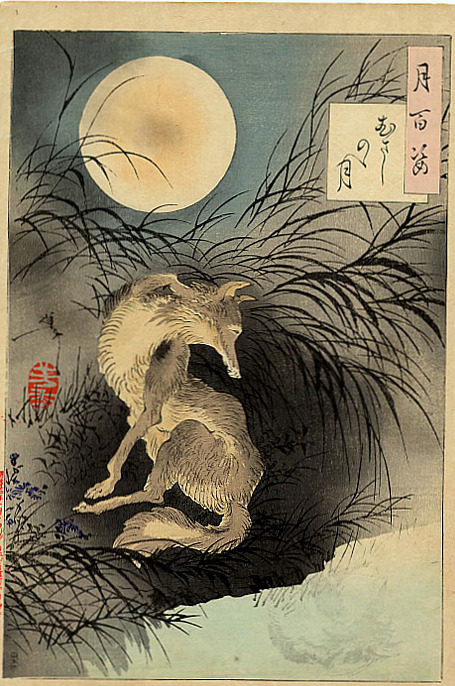 Interestingly, the Japanese word for wolf, ōkami (狼), is phonetically identical with the name of a great god or goddess, ōkami (大神: 大 ‎(ō, “great”) +‎ 神 ‎(kami, “god, spirit”), as in the case of the great goddess Amaterasu, who is also called ōkami; however, she never seems to have been identified with a wolf, only in 21st-century adaptations of her myth, though we should not make any assumptions ex silentio. The wolf is a guardian when it is properly attended to and cared for. - For example, he is a guardian who protects the traveller, as we can see in many myths and legends. Farmers used to worship wolves at shrines and left food offerings near their dens, beseeching them to protect their crops from wild boars and deer. Inu no ubumimai is a tradition in which one gives a female Honshu wolf rice when she gives birth to cubs; and in return she would protect the village and assist in danger (cf. Walker 2008). Here, we can also refer to India since Hindus traditionally considered that the hunting of wolves was a taboo since they feared that it may cause a bad harvest! In Japan, talismans and charms adorned with images of wolves were thought to protect against fire, disease and other calamities and brought fertility to agrarian communities and to couples hoping to have children. On wolves in Japan, cf. e.g. B.L. Walker, The Lost Wolves of Japan (2008), and J. Knight, Waiting for Wolves in Japan: An Anthropological Study of People-Wildlife Relations (2003). A wolf votive, dedicated to Oguchi no Magami, 大口真神, the "Large-Mouthed Pure God". 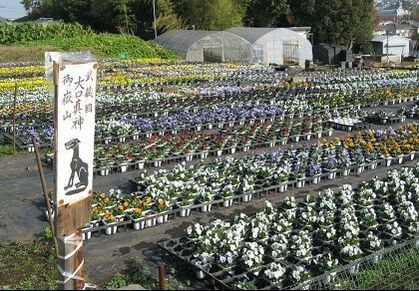 to protect the plants and fields from animals, like boar, deer, etc. In the year 1164, Okubo Samanosuke (a samurai of Minamoto no Yoshitomo) was on a pilgrimage to the famous Mount Mitoku (in Tottori Prefecture, 990m; the "Mount of thee virtues", 三徳, santoku: Buddhism's three primary virtues: wisdom, renunciation & judgement) to pray for the revival of his house/country. On the way he met an old white wolf, divine messenger of the god Myoken Daibosatsu (妙見山 - the originally Indian deity Sudrsti; also the deified polar star). Although he took up his bow to shoot the wolf, he decided otherwise, helped the wolf in distress and let it go. The following night the god Myoken appeared in his dream and told Okubo Samanosuke about a sacred spring at the roots of the old camphor tree (Kusunoki, 老楠). The god Myoken revealed its location to Okubo in appreciation that he had spared the white wolf's life. Next day, Okubo discovered the hot spring (kabu-yo) at the place which the god indicated, and its water would heal many diseases of the local villagers. This was the beginning of Misasa Onsen which still today is a famous "spa" where the myth has been immortalised by a sculpture: see http://spa-misasa.jp/eng/. Here, at Misasa Onsen, we also find the Misasa Jinsho, the "Tug-of-War Festival", a folk ritual that takes places between two teams that are divided into "east" and "west". The shape of the rope, formed from the fuji-kazura trees, from the sacred grounds of Mount Mitoku, represents the harmonising of humans with nature. Again my apologies for the unreliable source: http://spa-misasa.jp/eng/ and http://heianperiodjapan.blogspot.co.uk/2015/07/daibosatsu-legends.html and finally http://spa-misasa.jp/japan-heritage/en/spa-misa/ - If you know a better source of this myth, let me know please. 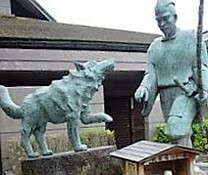 Modern sculpture depicting the legend: the samurai Okubo Samanosuke, with his bow, encounters the white wolf. 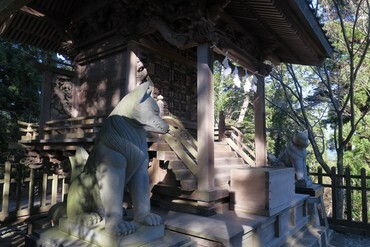 Wolf guardian and/or god at Mitsumine Jinja (photo: Aether Song). For further information, see a detail from this image above in text. Takeru and the wolves guiding him, according to history/legend. Since ancient times, people in Japan had faith in the 狼, "wolf god", the "Large Mouthed Pure God", 大口真神. (Sorry, I have not found the source for this image, yet; hence, I'm not sure about date or origin!). Work in progress - for comments & suggestions: ralph.haussler@uclmail.net - Thanks! The information contained in this website is for general information purposes only. I endeavour to keep the information up to date and correct, but I cannot guarantee its completeness, accuracy, reliability or suitability. I am not responsible for any action taken as a result of the information or advice on my website. Through this website you are able to link to other, external websites which are not under my control; these links are being provided as a convenience and for informational purposes only; the inclusion of any links does not necessarily imply a recommendation or endorse the views expressed within them, and I bear no responsibility for the accuracy, legality or content of the external site or for that of subsequent links. Contact the external site for answers to questions regarding its content. Some off-site links might change in the course of time, and content might change as well; if a link is not appropriate, or if it no longer exists, please let me know so that I can remove it. I always welcome any comments to improve the site. The content and research of this website is protected by copyright. No portion of this website may be copied or replicated in any form without the written consent of the website owner. Many of the images on this page come from external sites: I have tried to find out the copyright owners of all the images on this page and I apologise if I missed someone or if I was not able to find the original sources/photographer/copyright owner. The site is still work-in-progress: sorry if I forgot to add a reference.